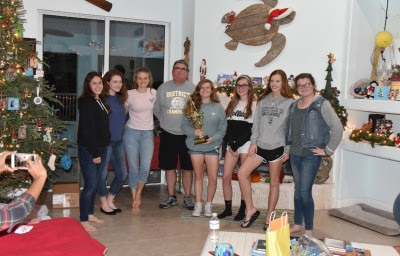 The MCC Girls Golf team celebrated its 2018 season at the home of John and Pam Stimpson, on December 7, 2018. Each golfer received a Back to Back 2017-2018 District Championship t-shirt, athletic certificate, and varsity bar/pin. * MVG and District 12 Champion Golfer of the Year-Elise B.